The seven big bank CEOs who testified on Capitol Hill Wednesday morning are facing pressure over their lavish compensation. In an exchange between New York Democrat Nydia Velázquez and Citigroup CEO Michael Corbat, Velázquez asked Corbat to defend the fact that his $24.2 million yearly salary for 2018 was 486 times his own company’s median worker salary at $49,466. Compensation has been one talking point on a list of many topics covered in the hearing, which marks the first time that the large bank CEOs (representing JPMorgan Chase, Citigroup, Bank of America, Goldman Sachs, Morgan Stanley, State Street, and Bank of New York Mellon) have simultaneously addressed Congress since the financial crisis. In a separate exchange, California Democrat Katie Porter questioned JPMorgan Chase CEO Jamie Dimon about whether a bank teller at his company gets paid a living wage. Dimon said lower paying entry-level jobs provide the promise of elevating up through the company. “She may have my job one day,” Dimon said. 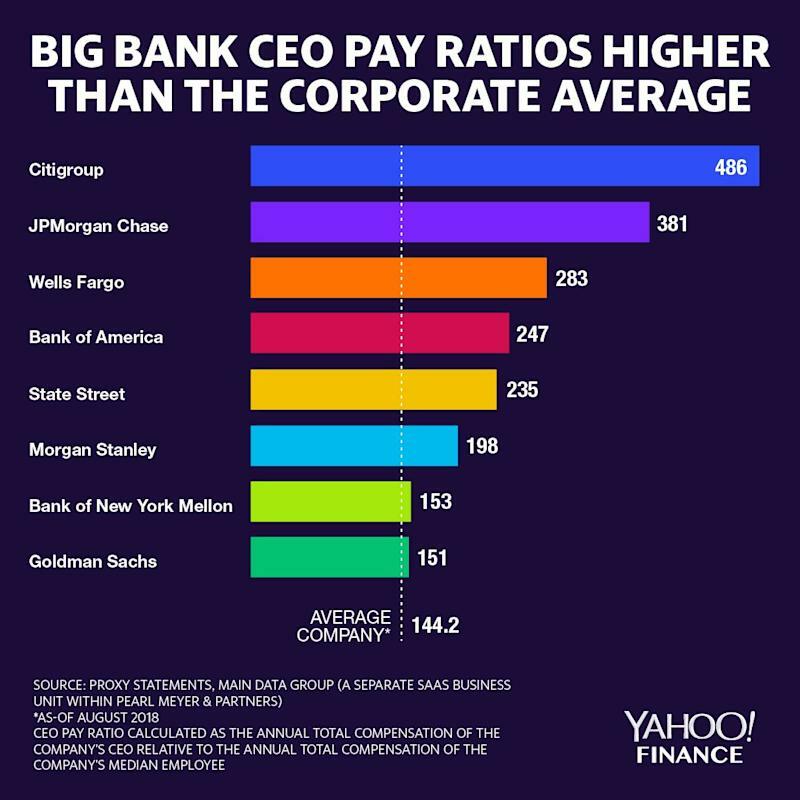 Among the large banks, Citigroup has the highest CEO pay ratio when measuring the top executive’s pay to the median employee’s salary. JPMorgan Chase comes in second place with a pay ratio of 381:1. Bank of New York Mellon and Goldman Sachs have a higher salary levels for the median employee because they don’t employ the lower wage bank tellers that the more consumer-facing banks do. In pure dollar amounts, Corbat does not make the most. Dimon made the most in 2018, netting $30 million, mostly in the form of shares. 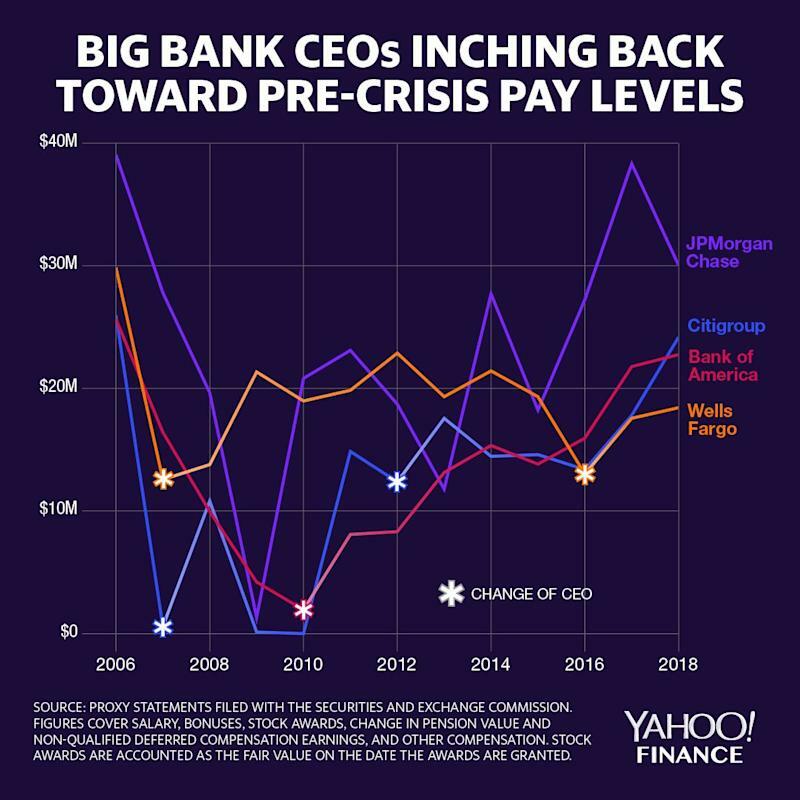 According to proxy statements since 2006, the CEOs from the four largest U.S. banks — JPMorgan Chase, Citigroup, Bank of America, and Wells Fargo — have had their compensation steadily rise over the post-crisis period. Those figures include bonuses, stock awards (valued at the date granted), change in pension values, and other forms of compensation. Pay levels dipped during the crisis as companies pared back salaries to avoid the optics of inappropriate executive pay. They also dipped because the government required banks that took bailout money to impose temporary salary caps on its executives. The steady climb up in bank CEO pay since the crisis has been the result of the banks’ improving performance, says Laura Hay, head of the banking industry team at executive pay consultancy Pearl Meyer. Hay says that in addition to a favorable U.S. economy that continues to extend its recovery, banks are benefiting from the regulatory pendulum swinging toward reduced red tape on the industry. Since the Trump administration took office, lawmakers — including some moderate Democrats — have supported efforts to pare back some of the post-crisis Dodd-Frank regulations that forced banks to beef up regulatory capital. Still, California Democrat Maxine Waters, who chairs the committee, has had executive compensation on her mind ever since the Wells Fargo scandal broke in 2016. She soon after introduced the “Megabank Accountability and Consequences Act,” which proposes fining corporate executives up to 100% of their total compensation if they knowingly allowed their companies to violate consumer protection laws. In the hearing Wednesday, the CEO pay ratio raised questions about whether or not the big banks are being proactive enough to narrow the disparity between executive pay and the median worker. Velázquez noted that CEO pay is authorized by the company board and its shareholders, but said the bank executives have levers to lower the pay ratio. Analysts flagged CEO compensation as a suggested line of questioning ahead of the hearing. Wells Fargo senior analyst Mike Mayo, for example, expected the CEOs to be asked to defend their pay. “There is concern about minimum wage and gender pay equity,” Mayo wrote. But Mayo added that the focus on pay ratio could encourage more automation instead of higher wages. By eliminating low wage jobs entirely, the median employee would represent a more senior or corporate-level employee with higher pay, thus lowering the CEO pay ratio. Bank of America earned some favor today by taking the higher wages route. A day before the hearing, the company announced that it will raise the minimum wage for its employees to $20 an hour over the next two years. In opening statements, Bank of America CEO Brian Moynihan said those efforts are part of his “responsibility that we are a great place to work.” The remarks prompted clapping from some watchers in the room who were then removed at the request of Waters. On executive pay, policymakers are still grappling with whether legislative or bureaucratic action is necessary. The post-crisis Dodd-Frank regulatory framework required regulators, including the Securities and Exchange Commission, to implement reporting requirements and some limitations on executive pay. But ten years after the crisis, some reform measures are still in the pipeline. Hay said she does not see any major executive pay changes coming anytime soon, also ruling out any explicit caps on bankers’ pay — like the bonus cap implemented by the European Bank Authority.